2 C milk, whole is best, but you can use 2%. Do not use skim milk. Gouda is also a wonderful choice for this dish. Yes, you have permission to use a little more cheese. It will be very thick inside instead of creamy, but it will be extremely delicious. Do consider adding cheese to the top as it adds to the volume of seriously browned cheese goodness. Technically it will no longer be scalloped if you top it with grated cheese (it will be au gratin), but I won’t tell if you won’t so I’ll put that in the directions. Slice the potatoes after the sauce is made. This way you can keep an eye on the volume in your casserole dish and not waste any potatoes by slicing too many. You want the entire thing to be about 3/4 inch from the top of the dish. If it is closer, be sure to put a piece of foil underneath to catch the drippings. Preheat the oven to 350 F. Spray a 2 quart casserole dish with cooking spray. In a medium pot, make a white sauce (Béchamel). Melt the butter over low heat. Add the onions and stir for 3-4 minutes. The goal is to soften, not brown the onion. Blend in the flour, pepper, and rosemary. Stir the flour until the it is absorbed completely with the butter. Cook, stirring constantly for 1-2 minutes. This gives the flour a chance to cook off the fresh flour taste. Don’t stop stirring. You do not want the flour to brown or burn and that can happen faster than you think. Slowly add the milk, about a third at a time, mixing well as you go, smashing floury lumps. Stir slowly and constantly until the sauce nearly boils and thickens. This is the most mindful part of the process. Chill a bit and stir. Watch as the milk thickens. It’s so beautiful. You don’t want it to get stand a spoon in it thick. It should have a thick milk feel as you stir. The cheese will thicken things up plenty. Stir in the Jarlsberg. If you want to put some on top, reserve half a cup for that. Remove from heat, stirring to melt the cheese. Layer half of the potatoes in the casserole dish. Pour half of the sauce over the potatoes, lifting slices with a fork and spreading the sauce until it covers them all. Layer on the rest of the potatoes and pour on the last of the sauce, spreading it evenly all across the top. 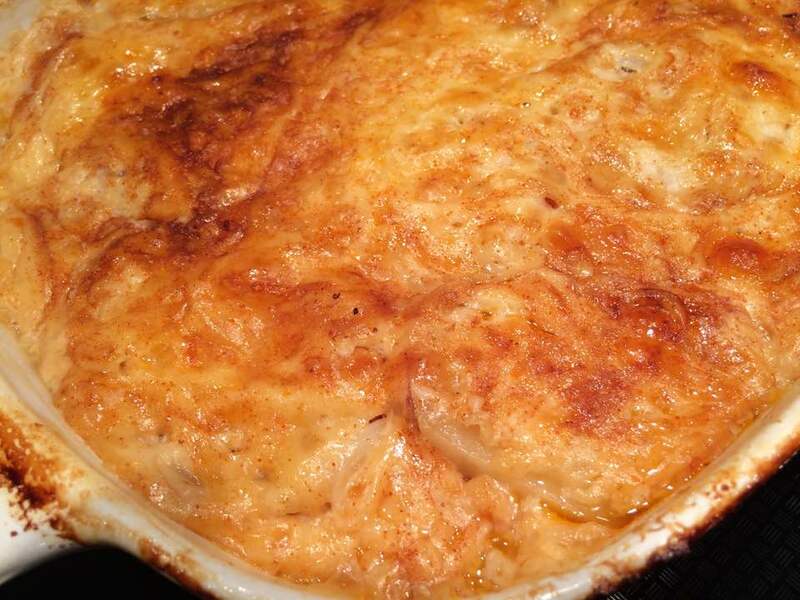 Top with the reserved cup of cheese if you are going au gratin and sprinkle the top with a little paprika. Cover and bake for 1 hour and 45 minutes or until the potatoes are soft when poked with a fork and the top browns up nicely. How long this takes depends upon how thick you sliced your potatoes. Remove the dish from the oven to sit uncovered for 10 minutes so that it “sets” before serving. Beautiful paired with a grilled or pan seared steak. Excellent reheated, but there is not likely to be anything leftover. 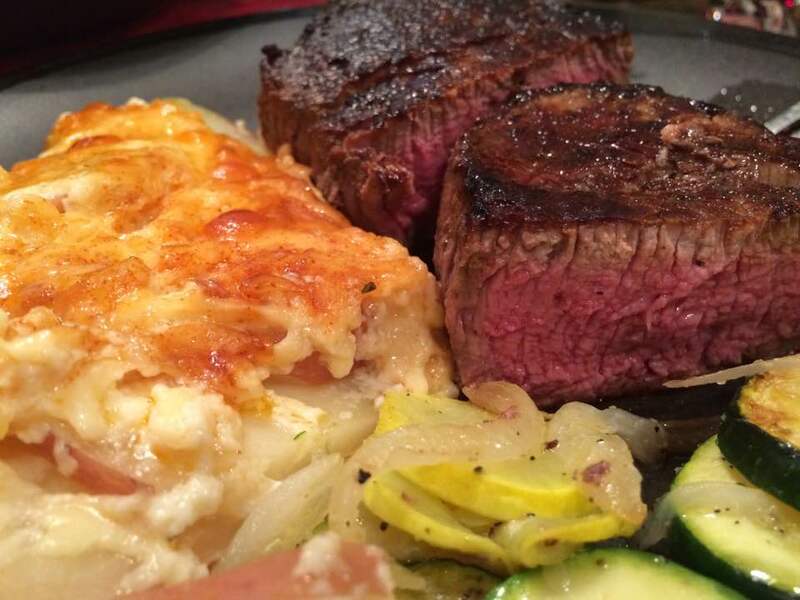 This entry was posted in Side Dish and tagged Cheese, jarlsberg, potato, scalloped. Bookmark the permalink.